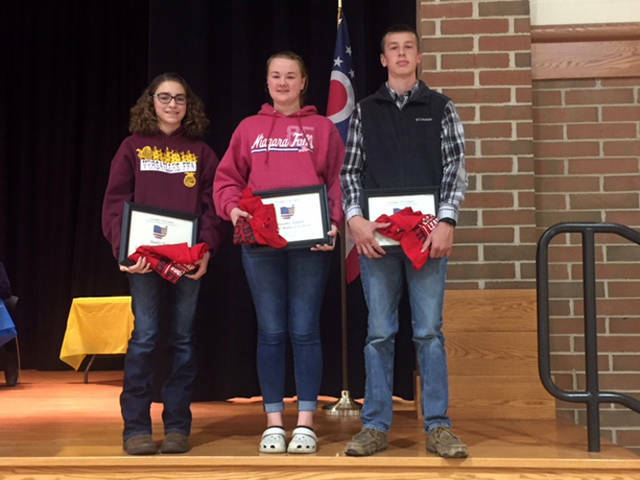 Versailles FFA members (l-r) Madison Henry, Breanna Nieport, and Noah Barga were named the Versailles FFA members of the month. VERSAILLES – Three dedicated members were recognized at the Versailles FFA meeting on Oct. 15. They were Breanna Nieport, Noah Barga and Madison Henry. The first member recognized was Nieport. She is the daughter of Tony and Cheryl Nieport. She has participated in Parliamentary Procedures and Food Science CDEs. She has been actively involved in the Greenhand Conference, Ag is Cool Tent, Poultry Days, State FFA Convention, Junior High FFA, Omelette Breakfast, Color Run, Fall Harvest Sale, EMT Firefighter Safety Training and many other activities. Her SAE consist of growing a garden. She received a FFA T-shirt and certificate for being recognized as a member of the month. The second member we recognized was Barga. He is the son of Michael and Gwenn Barga. He has participated in General Livestock, Parliamentary Procedure and Tractor Troubleshooting CDEs. He also has been actively involved in Poultry Days, College and Career Fair, showing at the fair and numerous other activities. Barga currently serves as the assistant treasurer. He has two SAEs, with his first SAE consisting of raising bees and selling honey. His second SAE consist of milking goats and selling the goats milk. He received a FFA T-shirt and certificate for being recognized as a member of the month. The final member recognized was Henry. She is the daughter of Ron and Arianne Henry. She has participated in Agronomy, Ag Issues and Parliamentary Procedure CDEs. She also has been actively involved in the Greenhand Conference, Shop and Crop, Rural King Hot Dog Stand, Poultry Days, New Member Fun Night, Leadership Night, Hunter Safety Program, College Fair, Pork Loin Dinners, Fruit Sales and numerous other activities. Henry currently serves as the assistant reporter. Her SAE consists of raising layer chickens and broilers. She received a FFA T-shirt and certificate for being recognized as a member of the month.